Seeing flying ants in your home is never a good sign, but having these winged ants in your home in the winter is especially problematic. This is because ants only fly - or even have wings - when they are getting ready to breed. In the summer, the flying ant may be a species that lives outdoor and simply got inside through an open door or through another gap or crack. hind wings being shorter than front wings. If it has these characteristics, it is a carpenter ant. Carpenter arts are also more likely to be seen out in the open than are termites. While both carpenter ants and termites can be very destructive to homes, the two species are different because termites eat the wood in which they tunnel, but carpenter ants only nest in it; they do not eat it. So another difference of carpenter ants is the frass (wood dust, soil, and insect parts) that is often found beneath openings to the nest. Whether the winged ant you see is a carpenter ant or a termite, however, the wings mean that the insect is a reproductive male or queen—the only members of an ant colony that can reproduce. Ants and termites swarm to mate, then the males die, having done their duty, and the queens drop their wings to find a nesting site. 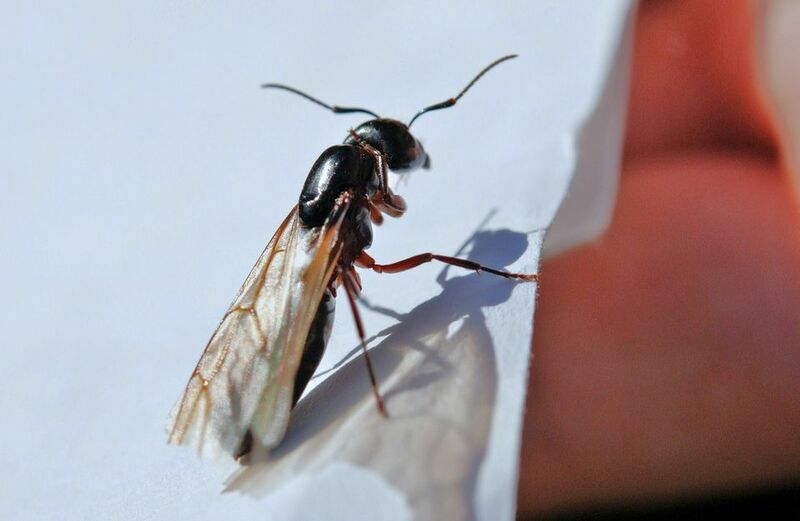 Because of this, a winged ant seen indoors during the summer may just mean that it flew in from outside, and it will likely die before it could find a good nesting site, and no pest control is needed for the ant. But because the ants are not active outdoors in the winter, a flying ant seen indoors at this time most likely means that the ants are nesting within the structure. It is rare for termites to swarm at all in the winter, but they have been known to do so in warm areas of infested buildings. So the sudden appearance of swarming ants or termites in flight is one of the first signs of indoor infestation. While carpenter ants may be found nesting in dry wood, they are more likely to be found in wood that is wet, damp, and/or rotting. The first step is to repair or replace the rotted wood to remove the harborage and help prevent future infestation. Next would be the use of an insecticide to kill ants that have built their nest indoors. Dust: One option is insecticidal dust that is labeled for carpenters ants and for indoor household use. This can be injected into the area(s) where the ants are nesting. If it is difficult to get to the area, small holes may need to be drilled so the dust can be injected. Bait: Another option is baits. Although baits are much slower acting, they can be easier and safer to use. The foraging ants will pick up the bait and carry it back to the colony and queen to eliminate the entire colony. Because ant baits sold in stores are often labeled for many different ants, always read the label to be sure it is labeled for carpenter ants and follow all label directions. Spray: Insecticide sprays will have little impact on foraging ants because the spray will kill only ants that are foraging for food. But if the ants have simply flown indoors from outside, sprays can provide kill of these occasional invaders. When using any insecticide, it is important and required by law to read and follow all labeldirections.